The question of Pathfinder 1e’s fate has come up before. Will it continue to be loved like AD&D 1e while Pathfinder 2e is received like D&D 5e, or will it be obscured by PF2e’s shadow leaving a notable portion of the industry’s content languishing on the digital (and physical) shelves. It’s a real consideration for many tabletop RPG companies. Yet, as the industry waits for PF2e’s final form and fan reactions, there is an opportunity to take the long tail of Pathfinder 1e products and sell them at a considerable discount. 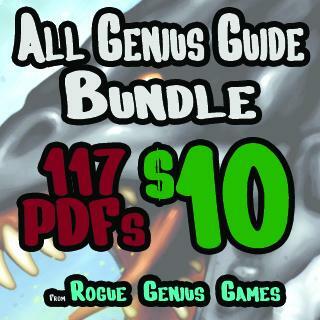 Enter Rogue Genius Games‘ ALL Genius Guide Bundle! This is an extensive collection of Pathfinder 1e products that are all but official. 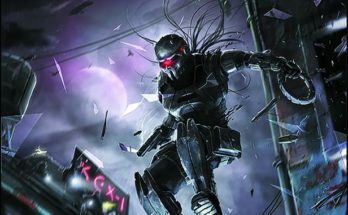 I’m not going to attempt to tempt you with specific offerings from the bundle [sample list at the end of this article], instead, I’m going to stand by the “all but official” statement by pointing out who Rogue Genius Games is. It’s Owen KC Stephens. Who is Owen KC Stephens? Currently, he’s the Starfinder Design Lead at Paizo Inc., Lead Developer at Rogue Genius Games, and Pathfinder Developer at Green Ronin Publishing. If that’s not enough to make you believe that his Pathfinder work will be canon, he was also a Developer at Paizo, Pathfinder RPG Developer at Super Genius Games, and an RPG Designer at Wizards of the Coast. Are RGG’s Pathfinder products official? No, but coming from the keyboard of Owen KC Stephens and “the creative talents of Stan!, Lj Stephens, Alex Augunas, & the Four Horsemen (Dan Dillon, Steve Helt, Stephen Rowe, & Tim Hitchcock),” these are as close as you can come to Paizo, but at a fraction of the price. This Open Gaming Store bundle ends on Monday, December 31, 2018. You can purchase these PDFs here. Ends on Mon, January 7 2019 12:28 AM EST. “A wilderness-horror setting and rulebook for the world’s most popular role-playing game. Beyond the reach of roads, past the scope of mortals, there is a darkened place. A shadowed tree-line where no-one dares cross and whose boundaries go undisturbed. This is not the woods of peaceful fey and beast, but the dark and twisted children’s tale that kept you full of terror. It is a world of fear, madness, and bloodshed; ruled over by the uncaring watch of ancient trees. There is no bargaining with the primal forces that rule the uncivilized world, as you have nothing they could ever want. The woods do not care for you. Never forget that. Into the Wyrd and Wild is a supplemental book for those seeking to incorporate a weird and terrifying wilderness into their role-playing game. 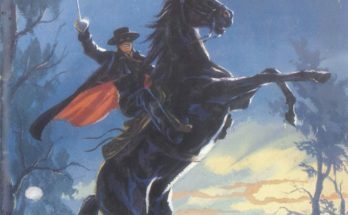 Players and GMs who enjoy a level of horror and prefer the sweeping, darkened landscapes of forest and mires to the well-trodden cobblestone of dungeons need look no further when it comes to books. Presented within the book is a light overhaul of the adventuring system, modified to fit better with a campaign centered around forays into the frightening wilderness. In addition to stocking the area with new monsters and set pieces, Into the Wyrd and Wild is also an attempt to increase the playability of the wilderness. Rather than have the wilderness remain a place along the way to a dungeon, it seeks to make the wilderness a dungeon in itself. Included in this is an essay on design theory as well as a way to easily and randomly construct a wilderness dungeon. The book contains a variety of information for both GM and players alike. For players, there is a vast array of strange items and artifacts, each embodying the haunting and feral nature of the Wyrd and Wild. There is also a section devoted to spells, specifically, Wyrd magics that may be just as deadly to the caster but offer great and terrible powers if they choose to harness it. Finally, there is a list of the odd and useful floras that dwell within the wilds, plant-life that ranges from profitable and wondrous, to deadly and loathsome. For GMs, this book contains every possible thing you might need to run a wilderness-horror themed game. Monsters that present unique and specific challenges to the player, while also being terrifying and lethal; simple rules for use in the Wilds that make gameplay both easier and deeper; unique factions that exist within the Wilds, for use or adaptation in a home game; and of course a plethora of tables for generating random locations, treasures, encounters, and more. Rules and stats are written bare-bone with the intention of being widely compatible. Enough information is given that a GM and player can easily adapt it to their own preferred system. Rules for Moon Cycles and strange phases. Rules for hunting, tracking, and butchering monsters. 40+ dangerous and terrifying monsters. 40+ strange and savage items. 40+ spells and rules for channeling the Wyrd. A step-by-step guide for generating your own wilderness adventure. Tables upon tables of random diseases, wilderness dressings, traps, hazards, flora, encounters, and MORE. All illustrated with over 250 pieces of original art. 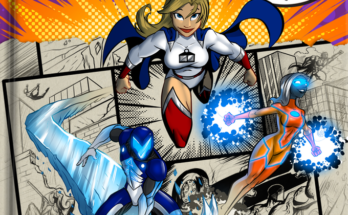 Does Charles Ferguson-Avery’s art look familiar? It’s the inspiration for the recent Never Going Home RPG by Wet Ink Games. Never Going Home took Wet Ink Games’ Compass System and applied it to the artwork and world crafted in Charles’ artbook, World War Occult, resulting in a Kickstarter that far exceeded its goal on December 3rd. On that same day, Charles launched a Kickstarter for Into the Wyrd and Wild, a D&D and OSR product that “has been written to be as system-neutral as possible.” The stats will be pretty bare-bones, but the ideas will be there. Add to it, the art style is good enough to inspire one RPG, so it’s more than capable of being the foundation for a great new project. Both the art and video evoke the advertised feeling of dread. For horror, based on the art and video, this project has a real shot at being an engaging dark adventure for your gaming table. To clarify, Wet Ink Games licensed Charles’ work as the basis for Never Going Home. The Kickstarter for Into the Wyrd and Wild is by Charles, not Wet Ink Games. I mention this so it does not seem like WIG, or Charles, are going back to the crowdfunding well too quickly since they’re separate companies with separate staffs. This crowdfunding campaign ends on Monday, January 7 2019 12:28 AM EST. You can support this Kickstarter campaign here. Ends on Sun, January 6 2019 4:49 AM EST. Low Fantasy Gaming is a tabletop RPG built for gritty adventures in low or moderate magic settings. It has simple rules, dangerous combat, flexible PC customization, and mysterious, unpredictable magic. Designed for short, episodic adventures in sandbox worlds, LFG provides the mechanics and tables needed for easy GM improvisation. It’s a heady mix of the best old school, modern, and new game design, wrapped around a familiar d20 core. 12th Level Max eliminates the most powerful spells and keeps the mightiest monsters scary. Unique Features: every 3rd level design your own PC ability in conjunction with your GM. Don’t want to make your own? Choose from 36 examples instead. Dangerous Combat: Dropping to zero hp requires a roll on the Injuries & Setbacks table and healing is delayed by 1d3 minutes (magical or otherwise). Players don’t roll to find out if their PC is All Dead or Mostly Dead until the battle ends and someone checks the body. Dark & Dangerous Magic tests and Divine Rebuke tests make all spellcasting inherently uncertain. No at-will, teleport, mind reading or resurrection magic. Magic Users are less reliant on spells, proficient in one-handed weapons and light armor. 130+ Monsters including effective Boss Monster options (eg: Off Turn Attacks match the party’s action economy, and Stronger Luck grants saves even when a save is not normally permitted), plus Custom Monsters guide. Online Play Support: an LFG character sheet is available for online play via Roll20. Open Game Content: 99% of LFG text is “Open Game Content” under the Open Game Licence. Want to make your own adventures or expansions for LFG and sell them? Go right ahead! Why Low Fantasy Gaming? You want low to moderate amounts of magic and the challenge of death, yet game balance. If you’ve ever played AD&D without magic, it’s a meatgrinder as you face off against creatures that don’t have to fear you because they can fly or can only be hurt by magic or worse. That’s to say that the game was intended for magic. In contrast, LFG was not. If you’re looking for a variant d20 system with extras, grit, all for simple adventures, this may speak to you. If you enjoy LFG and create an adventure for your table, then write it up and publish it. Pickpocket Press wants you to expand its world and don’t begrudge you profiting from it. It’s a lovely taking to the spirit of the OGL. D&D 5e’s System Reference Documents (SRDs) at http://www.5esrd.com/ for rules about the current version of D&D. Sword & Wizardry’s System Reference Documents (SRDs) at http://www.d20swsrd.com/ for rules about an OSR. This crowdfunding campaign ends on Sunday, January 6 2019 4:49 AM EST. You can support this Kickstarter campaign here. What comes in the ALL Genius Guide Bundle! by Rogue Genius Games? Here’s a sample of the titles for the 117 Pathfinder 1e PDFs for $10! The Genius Guide To Loot 4 Less Vol. 10: Fezzes Are Cool!